30th anniversary gifts for your wife are traditionally pearl or you also have the modern anniversary list where you celerate with diamonds! Both gift lists result in some fabulous jewelry and with the modern twists that jewelry designers are adding to their designs they are bang up to date. Everyone's lifestyle is much busier than in the past and we do not all spend our evenings dressing for dinner and attending sumptuous balls, so your choice of gift needs to fit in with your life. You don't want your gift to be put stored away safely and only worn on special occassions, you want to see it worn and enjoyed. 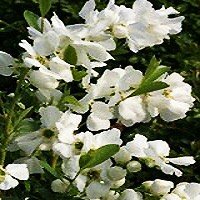 If your wife loves flowers then this gorgeous Pearl Bush - Snow Day Surprise would look stunning in the garden and a very unique pearl anniversary gift. 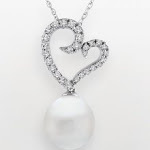 Everyone knows that your 30th is celebrated with pearls, this beautiful necklace shows your wife just how much you love her too! 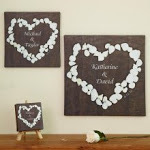 The pearls in this canvas are the color of pearls and you can personalize with your names. You could then maybe buy a bouquet of pearl colored roses to compliment your gift. Lots of great canvas' that would be fantastic for an Anniversary. Traditionally your 30th is pearls and on the modern list it is diamonds. You could buy a gift that combines the two or you could create an even more personal gift. This birthstone necklace has both of your birthstones on interlocking hearts and is gorgeous. Available to buy in our Anniversary Store today. 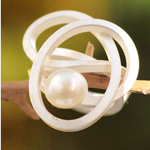 Your wife will appreciate the craftmanship of these stunning pearl pieces. Plus they are so unique your wife will adore them forever. There are some great pieces and also great prices on jewelry` with 15% Discount on all purchases made from MyJewelryBox there is something for everyone and all budgets. trinket boxes can all be decorated with mother of pearl and they are beautiful. Plus mother of pearl is believed to bring prosperity and good fortune and also have healing properties for stress relief and calm. 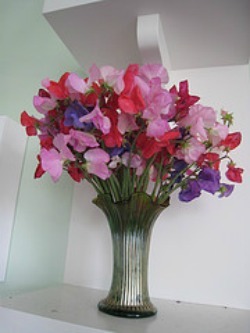 If your wedding anniversary is in the summer then you have the Sweet Pea as your 30th anniversary flower. It is a beautiful and fragrant flower and you could be extra romantic and grow your own, they are relatively easy and your wife would feel very special knowing the time you took to grow her lovely present. You plant the Sweet pea seeds in pots from around February/March time and keep them safe in a greenhouse until you can plant them out in the Spring. They will start to flower from May and will last through to the Summer if you look after them. The one down side I find to Sweet Peas is that although they smell amazing they set off my hayfever so I have to keep them outside and look at them from the window! If you are not celebrating your anniversary in the Summer then you can get Sweet Pea fragrances and lots of other sweet pea gifts. Here are some that are just lovely.